Check out our 2012 post HERE. 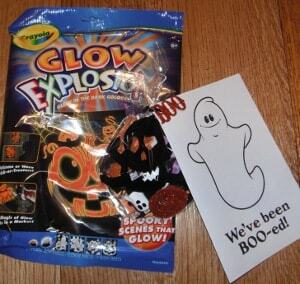 We came home this evening to find that we had been Boo-ed! 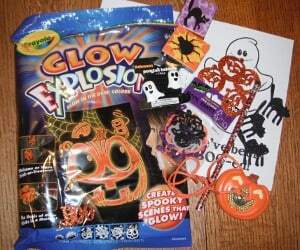 On our doorstep were two bags full of Halloween goodies. According to the paper in the bag, to Boo someone, you just print out the paper HERE, fill a bag with treats, leave it on a doorstep and run. It was the first time we’ve ever been Boo-ed, and it made our day! 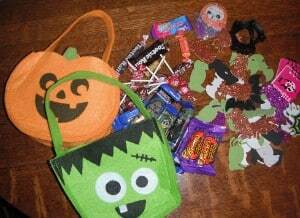 The bags left on our step had candy, Halloween crafts and odds and ends. The instructions say to keep the chain going and Boo someone the next day. So we got to work and started to assemble our own bags. The website also says to fill at least two bags. We made 5 so all little brothers and sisters were included. We filled buckets (like THESE) with stickers, bracelets, hair ties and pencils… We also included a Crayola Glow Explosion Kit. We’ll take our bags out to Boo tomorrow. We plan to go in the daylight and I’ll call the other mom ahead of time, just so it goes smoothly with a 2 and 4 year old. 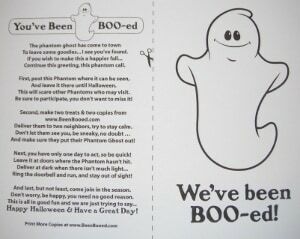 Have you been Boo-ed? If not, go HERE and start the Boo-ing in your neighborhood! I woke up today and we have been booed I never heard of it before I went to go out to the bus with my 5 yr old daughter and there where so much stuff in the bag all 3 kids could eat the candy and there where 2 crafts just enough for my 4 and 5 yr old to work on my 3rd kid is 2 so she wouldn’t have been able to do it.. who ever booed me in my neighbor hood had to know the ages of my kids and I thought the expression on my daughters face when she saw the bag was so priceless and now i will send it to a family that just moved into this neighborhood.. she has 2 kids and one is my 4 yr old sons age and the other is 8 months old.. so she will hopefully see it walking out with the kids.. my daughter is the one that spotted it and enjoyed the candy up tot to the moment the bus came..
🙂 And you can “Jingle” in December! Go HERE to learn more. We just moved into a new neighborhood and the doorbell rang, introducing us to this fun tradition! I love your printables which I'll include in the basket for the next neighbor! I write about adventures with the kids and all things travel http://www.theeducationaltourist.com and would love for you to stop by.